Internet Explorer 6, released on August 27, 2001, was a package of problems right from the start. Within a year of release, Microsoft silently declared that IE6 would not make enough money for them to continue supporting. The result has been numerous security problems, unfixed browser bugs, and a daily migraine for developers. Six years later, IE6 is still a thorn in the side of developers and it's been perfectly clear that IE6, for the following reasons, must die. We cannot support browser 10 years, this is ugly true. I'm a huge fan on PNG images. Though their file sizes can be larger than GIF's and JPG's, they are generally clean, crisp graphics. 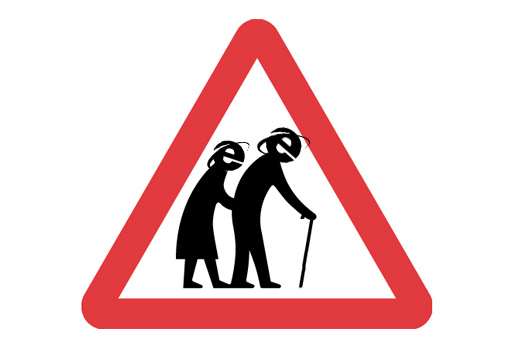 Internet Explorer 6 does not support transparency in PNG images, rather it displays an ugly gray color as transparency's replacement. Firefox, IE7, Opera, and Safari all support PNG transparency but IE6 clearly never will and that's holding back businesses from using PNGs on their website. Note: I am aware of the ".htc" patch and CSS fixes, but they aren't a good enough solution. Internet Explorer 6 adds double the amount of margin or padding on DIVs that are floated the same direction as the margin/padding. The easy fix to this problem is using the CSS "display:inline;" attribute:value on the DIV, but it's easily one of the most annoying problems created by Internet Explorer 6. Pseudo-classes and pseudo-elements are clearly important to enhance website design and control as can be seen in my article Advanced CSS Link - Spice Up Your Links. Pseudo-elements allow you to control the first line, first letter, content before and content after an element. Pseudo-classes allow you to select elements at specific states (hover, visited, etc.) CSS provides for hover/visited on anchors but no other elements. Min-height is a CSS attribute that I use in every single web project. Most of my website designs (given to me by my talented designer) require layers of background images and DIVs to be successful. Min-height is a valuable attribute because it allows me to set the necessary minimum height of the content DIVs so that the header and footer images (background or foreground) do not meet too closely with the content-area background. There's a very easy fix to this problem in my article Cross Browser CSS Min-Height but I prefer to avoid browser-specific fixes if possible. I've seen quite a few articles on how you can crash IE6 using very little code. These are just a few problems with Internet Explorer 6. Unfortunately I'm preaching to the choir — I'm not worried about my blog's audience, but the "Mom'n'Pops'" everywhere that don't understand the difference in browsers. For this reason, millions of ignorant internet users will stick to using IE6 which will result in programmers dedicating valuable time to fix IE6-caused bugs and will hamper pushing websites to the next level. Why? Enough is enough. Microsoft Internet Explorer 6 was released in late 2001. For its time, it was a decent browser, but in 2011, it is still in use by a significant portion of the web population, and its time is now up. What? 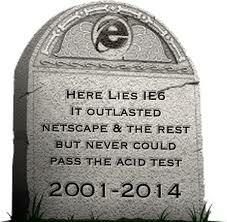 This website is run by a group of people who want to see IE 6 disappear as soon as possible. To help make that happen, we're encouraging the IE 6 users of our websites to upgrade to a more modern browser, so they can have a better experience using our sites and browsing the web. Getiblog is a collection of thoughts from Kyle Simpson said: On the other hand, Microsoft doesn’t want to get left behind in the consumer browser market either. Nor do I think they should be left out of that race. Clearly Microsoft has been, in the overall sense, a very healthy thing for the web. (hint: they invented Ajax… thanks Microsoft!). And btw, Firefox was born specifically to challenge IE to get better (when it was shut down for awhile). You may not like it, but Microsoft has a place in today’s (and yesterday’s and tomorrow’s) web. But the game of consumer browser is a fundamentally different game than platform browser. In consumer browsing, the most important features are performance (JS engine wars), productivity enhancements (tab previews, toolbars, etc), and new technology (CSS3, HTML5, etc). If a consumer browser is stable and doesn’t progress, it gets left behind. The IE (Consumer Edition) would at its heart be a very different browser than the IE (Platform Edition). Instead of releasing once every couple of years, IE-CE could release every couple of months. IE-CE could ditch all that legacy JScript extension junk (and ActiveX!) and fully conform to open web standards. They could embrace SVG, <canvas>, <video>, CSS3, and all the other amazing things that IE9 is only barely now giving us a glimpse of. Microsoft could stop being the joke of the open web community, stop playing catch up, and actually take the lead in helping innovate in the consumer browser space. The primary motivator for suggesting two different browsers is so that we never get into the browser lock-down mess we got into with IE6. If Microsoft ever convinces corporations to move to IE9 (or IE11 or whatever!?) as the new platform browser, that browser will become the new hated IE6 a few years from now. 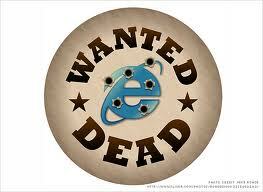 Do you still want to use Internet Explorer 6, here more 5 reasons why you shoud not. Your security and your company’s security are at risk: There’s no other way to lay it out: if the security of Google, Yahoo, and around 20 other companies were compromised due to people still running IE6, then your security is at risk too. Upgrading after a hacker uses this exploit to steal your information is simply too late, especially if you hold sensitive customer data. World governments are suggesting you switch browsers: Both Germany and France have issued warnings about Internet Explorer, asking citizens to switch to prevent the same type of breach that affected Google. Even Microsoft wants you to drop IE6: The Microsoft Security Research & Defense Blog specifically addressed the flaw and the risk of attack by platform. The most important part of the post was that they “recommend users of IE6 on Windows XP upgrade to a new version of Internet Explorer and/or enable DEP." This isn’t the first time Microsoft has asked people to voluntarily upgrade, but it is the first time that it’s been in response to an exploit or vulnerability. Think of it like a recall: would you keep driving a car that Toyota, Ford, or GM says could malfunction? Don’t make the same mistake with your computer’s security. Not wanting to upgrade from Windows XP isn’t a legitimate excuse anymore: One way to delete IE6 is to upgrade your OS — both Windows Vista and Windows 7 run upgraded versions of the IE browser. We understood why people didn’t want to upgrade when their choice was Windows Vista, but now that a very stable, solid, and secure upgrade is on the market (Windows 7), there’s no excuse not to upgrade. Yes, it’ll cost you up front, but it’s far cheaper than having your data stolen. This will not be the last massive IE6 security breach: This flaw was unknown before Google’s groundbreaking China announcement. And it’s not the first flaw ever found with the browser — there are at least 142 vulnerabilities in IE6, 22 of which are not yet patched. Would you use armor that had 142 weak spots? Do you still want to use Internet explorer browser 6 or less version? The most common bug is "ie6 png transparency bug hover" I like to fix it with jQuery library. What you said inspires me. If I know someone is using IE6, I will tell them to uninstall it and send your blog link to them. they will know why! Do you mind if I took this and put it on my ezines account? Very interesting post! Thanks for sharing..